You are here: Home » Community » Could you spare time to help a carer? Volunteers can help carers in different ways, through a telephone chat, computer help or keeping a cared-for person company occasionally. A free training session is to be held in Uckfield next month for people who would be prepared to support a carer looking after someone at home. The Association of Carers is organising the session and wants to hear from anybody who is interested in helping others. They can be contacted on 01424 722309. The charity says: “For half an hour a week you could chat to a carer on the telephone, giving opportunity for the carer to speak in a confidential and non-judgemental environment. 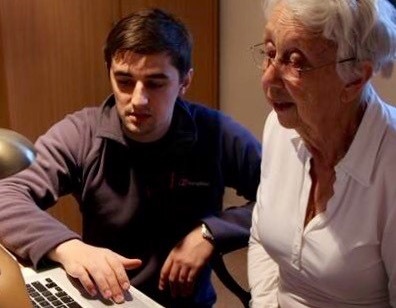 The charity says that for two hours a week you could offer computeer help at home, teaching a carer how to master such things as Skype, email and online shopping. For three hours a week, you could keep the cared-for person company at home while the carer gets a break, one that he or she would probably not get otherwise, to go and do anything from shopping, going to a hairdresser, or even getting some uninterrupted sleep. Full training and support is given and expenses paid and there is no physical care involved, so you do not need to be that mobile yourself. The Uckfield training session takes place on June 22. The Association of Carers support unpaid carers in East Sussex to continue in their caring role by providing free, high quality, volunteer-led services that encourage independence and reduce isolation. They currently work with more than 180 volunteers to provide their services to around 200 carers in East Sussex.